A report from the U.S. Global Change Research Program detailing the present and future impacts of climate change in the United States, and possible solutions. Global warming is real and it’s changing people’s lives at home and around the world. As our country increasingly experiences the impacts of climate change — from rising sea levels to extreme heat to floods and drought — it’s more important than ever that cities, towns, businesses, and individuals have access to the latest science on climate change. The National Climate Assessment (NCA) provides reliable information to address the unfolding impacts of climate change. Prepared on a regular basis by the U.S. 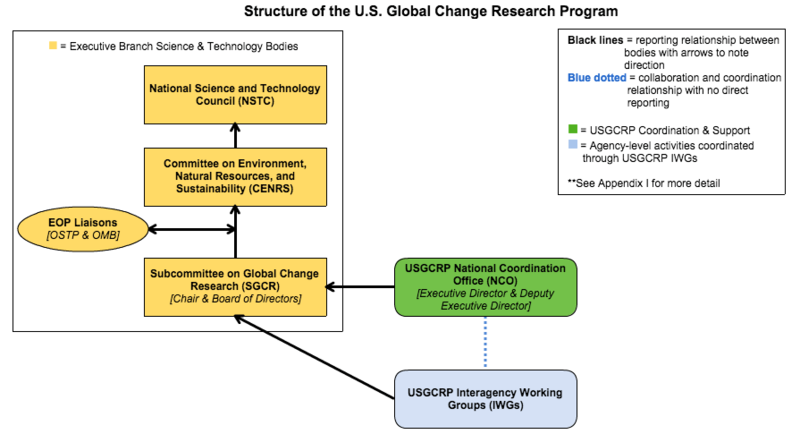 Global Change Research Program (USGCRP), the NCA is a comprehensive assessment of the current understanding of climate change science. The assessment includes an overview of present and likely impacts in the United States on a region-by-region basis, and it also details regional adaptation and mitigation strategies (i.e. how communities can cope with impacts, and the actions they have implemented to reduce heat-trapping emissions and slow the pace of climate change). The report assesses the many ways in which climate change affects our social, ecological, and policy systems. It is designed to inform strategies and policies on global warming for federal, state, and local governments, as well as to provide critical information for the private sector and individuals. The first NCA was released in 2000. Between 2002 and 2009, USGCRP produced 21 assessment products centered around five scientific goals, and then in 2009 released NCA2. The third report (NCA3) was published in 2014, and the NCA4 in 2018. What is the National Climate Assessment for? The NCA is an assessment of the best available science, written by hundreds of climate scientists and other experts from academia, local, state, and federal government, the private sector, and the non-profit sector. • Informs the government and the public about the current status of the climate, and anticipated trends. • Integrates research from different fields to highlight key findings and to identify areas for further research. • Establishes consistent methods for evaluating climate impacts across sectors and regions in the U.S.
• Provides useful and actionable information to prepare for a changing climate. • Analyzes the likelihood of climate risks in relation to different global levels of reduction in heat-trapping emissions. Why a National Climate Assessment? Concerned with the effects of climate change that scientists back then were already observing, Congress mandated the USGCRP to report annually to the President and Congress, and to produce a comprehensive, cross-sectoral report—the NCA—every four years. [The] Development of effective policies to abate, mitigate, and cope with global change will rely on greatly improved scientific understanding of global environmental processes and on our ability to distinguish human-induced from natural global change. If three decades ago understanding climate change was pressing, today it is critical. USGCRP produces the NCA and other special reports to address this challenge. Who uses the National Climate Assessment and how? People in the public and private sectors alike use the NCA as an important portal of information. The NCA provides sector-specific information targeted to, for example, the transportation, agricultural, and energy sectors, as well as regional information. The NCA can assist companies with their assessment of vulnerabilities to climate change. Defense agencies also use the NCA to assess risks and plan for different scenarios. For example, the Department of Defense has recognized the NCA as an important source of information for sea level rise projections and regional projections. 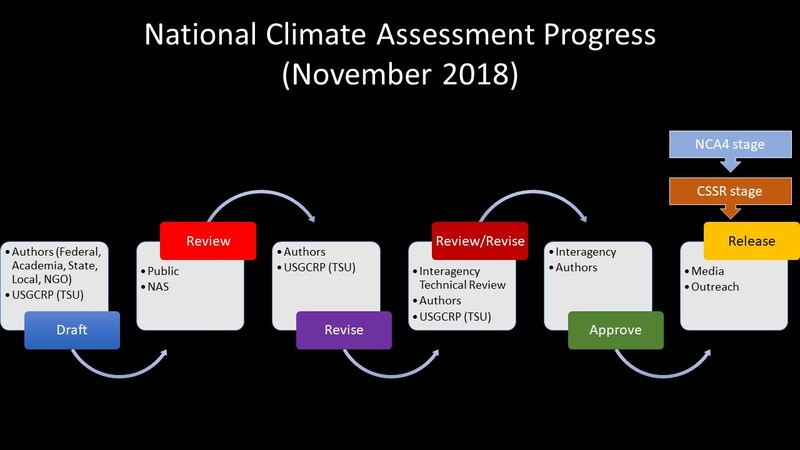 How does the National Climate Assessment work? While the NCA is legally required by Congress, the process of producing and reviewing the NCA changes with every report. For example, NCA2 collected the findings of 21 assessments produced over the span of seven years. NCA3 relied on a sizable external committee, whereas the NCA4 was led by a Federal Steering Committee with representation from the same 13 agencies that have a seat at UGCSRP. The USGCRP produces the National Climate Assessment and other major reports in coordination with different agencies and government offices. The White House Office of Science and Technology Policy (OSTP) and the Office of Management and Budget (OMB), and then the National Science and Technology (NTSC) council and its subcommittees interact at different capacities with USGCRP. You can find more information here. In NCA3 released in 2014, the USGCRP announced it would move to implement a sustained process. Regional and sectoral activities are ongoing and special reports are produced on a more frequent basis. As part of this effort, the USGCRP released the Climate Science Special Report (CSSR), billed as Volume 1 of the Fourth National Climate Assessment, in November 2017. CSSR provides an update to the physical climate science presented in NCA3, including new findings and projections published since the NCA3. CSSR is an important input to the authors of NCA4. Who reviews and approves the National Climate Assessment? Experts across fields, geographic locations and institutions draft the report. USGCRP holds workshops, listening sessions and offers other opportunities for public comment on the outline, and for submitting additional input materials. Prior to release, USGCRP opens the NCA report to a public comment period that allows any member of the public to submit comments and suggestions. National Academy of Sciences (NAS) also reviews at this time. Then, authors respond to every comment and decide what changes to make. Every public comment and their responses is made publicly available with the report. The final approval process for major USGCRP reports (like the NCA or CSSR) usually requires an interagency technical review that includes all 13 agencies of USGCRP, the Office of Management and Budget (OMB) and other federal offices doing potentially relevant work. The technical review is designed to catch any potential scientific ambiguities that remain, as well as to ensure that the agencies are all familiar with the final product. In each agency, the lead policy and/or legal office circulates the report internally. After this internal review, agencies may request authors to change ambiguous wording that could create apparent conflict with federal science or policy. Authors work with commenters to resolve any concerns, and authors must approve all changes. What's the latest climate science? "Global annually averaged surface air temperature has increased by about 1.8°F (1.0°C) over the last 115 years (1901–2016). This period is now the warmest in the history of modern civilization." "This assessment concludes, based on extensive evidence, that it is extremely likely that human activities, especially emissions of greenhouse gases, are the dominant cause of the observed warming since the mid-20th century." "Global sea level rise has already affected the United States; the incidence of daily tidal flooding is accelerating in more than 25 Atlantic and Gulf Coast cities." "Heavy rainfall is increasing in intensity and frequency across the United States and globally and is expected to continue to increase. The largest observed changes in the United States have occurred in the Northeast." "Recent record-setting hot years are projected to become common in the near future for the United States, as annual average temperatures continue to rise. Annual average temperature over the contiguous United States has increased by 1.8°F (1.0°C) for the period 1901–2016; over the next few decades (2021–2050), annual average temperatures are expected to rise by about 2.5°F for the United States, relative to the recent past (average from 1976–2005), under all plausible future climate scenarios." "The incidence of large forest fires in the western United States and Alaska has increased since the early 1980s and is projected to further increase in those regions as the climate changes, with profound changes to regional ecosystems."